AzhwAr wonders that despite clearly stating that only SrI rAma is to be taken refuge under, the samsAris are going about their ways, eating and making merry as well as talking ill of emperumAn, instead of seeking him. He concludes that this must be due to the deep involvement that they have with puRachchamayIs (other sects) and tells emperumAn that these purachchamayIs should be eliminated. அறுப்பதே கருமங் கண்டாய் அரங்கமா நகருளானே. arangamAnagar uLAnE – Oh, thiruvarangA! The dweller of SrIrangam! veRuppodu samaNar muNdar – with hatred, jainas and Saivas. These people, displaying their hatred, become red in their faces without any reason, on hearing auspicious details about emperumAn. The glories that vEdhas speak about and the torture that animals are subjected to during conduct of jyOthishtOma yAga (a ritual conducted for a person to reach indhra lOkam (svargam or heaven)) may be intolerable for the jainas and Saivas. Saivas would hang themselves when emperumAn comes out of temples in a procession or bang their heads when they hear the thiruchchinnam (bugle) blowing. muNdar – this refers to Saivas. As said in thiruchchandha viruththam (71) “mundan nIRan…” Siva’s disciples are like him with tonsured heads. Or it could be taken as samaNar muNdar together, which would refer to the tonsured jainas. vidhiyil sAkkiyargaL – the bhaudhdhas who are not fortunate enough to know about the greatness of emperumAn and to attain and enjoy him. ninpAl poRuppariyanagaL pEsil – if they utter anything that will be unbearable, about you – who is greater than everyone else and who is the leader among those with auspicious qualities. The jainas deny the existence of ISvaran and his paramapadham. Saivas elevate a jIvAthmA, Siva, as paramAthmA and have a habit of talking ill of paramAthmA (SrIman nArAyaNan). These acts are naturally unbearable for vaidhikas. AzhwAr, unable to repeat the crude words that such people utter, mentions these as “poRuppariyanagaL” (those which are unbearable). These AzhwArs feel shy even to bring themselves to repeating the cruel thoughts and words of such people about emperumAn – example, “thAn thIngu ninantha” in thiruppAvai, “anRinnAdhana sey sisupAlanum…” in nAchchiyAr thirumozhi. An incident is quoted here by vyAkhyAthA – mahAbali, the grandson of prahlAdhAzhwAn, approached prahlAdhAzhWan and told him that his empire was shrinking and wanted to know the reason for this. prahlAdhAzhwAn told him “you are troubling the dhEvas (celestial people) to please asuras (demons) and dhEvas have complained to SrIman nArAyaNan in thiruppARkdal (the milky ocean – where emperumAn resides to hear the issues of celestial people). SrIman nArAyaNan has promised to redeem their lost possessions and has taken incarnation as son of adhithi. You can take it that your possession is as good as lost” Upon hearing this, mahAbali started abusing SrIman nArAyaNan. SrI prahlAdhan plugged his ears and told mahAbali “You are lost. You abused SrIman nArAyaNan in my presence. Instead of this you could have done me a favour by beheading me. As a result of your abusing emperumAn, may you lose all your possession” and cursed him, says purANas. nanjIyar, one of our preceptors, asked his AchAryan SrI parAsara bhattar “prahlAdhan is an ascetic. Is it correct on his part to consider an empire as desirable and curse mahAbali that he would lose his kingdom?” bhattar responded saying that denying food that it craves for is the way of punishing a dog. In the same way, denying the kingdom that he values most is the punishment that can be meted out to mahAbali. Denying sandalwood paste and betel to a prince is the just punishment, says the vyAKhyAthA. pOvadhE nOyadhAgi – if the person who hears the abuses about emperumAn were like piLLai thirunaRaiyUraiyar (who gave up his life on seeing emperumAn’s vigraham set afire by miscreants at thottiyam thirunArAyaNapuram near SrIrangam), he would give up his life. Or else, instead of remaining at the place where emperumAn is being abused and looking at the abusers, he should leave the place immediately. “gurOr yathra parivAdhO nindhAvApi pravarththathE I karNau thathra pidhAthavyau ganthavyam vA thathOnyatha: II” This is from manu smrithi which says where one’s AchAryan is being abused or spoken ill of, one should plug his ears or leave the place. kuRippenakku adaiyumAgil – if instead of ending one’s life or leaving that place as mentioned in the previous paragraph, opportunity is available to destroy the enemy. kuRiththal – thinking about carrying out a task and opportunity being available to execute it. kUdumEl – if possible. Instead of getting caught by the enemy and getting killed, if it is possible to catch hold of the enemy and destroy him. AzhwAr uses the condition “El” (if) to emphasise that it is not easy to carry out this task (of eliminating the enemy). thalaiyai AngE aRuppadhE karumam – it is proper and justified to behead the person who had indulged in abusing emperumAn at the same place where the abuse took place. It is one’s duty. It is a good deed for the one who carries out beheading because he doesn’t have to hear the abuse anymore. It is also a good deed for the abuser because it prevents him from further abusing emperumAn and earning emperumAn’s wrath more and more. In agnishOmIya yAgam (a ritual) in which an animal is sacrificed, SAsthram says that both the animal which is killed and the yajamAna (one who carries out the ritual) who kills the animal reach svargam (heaven). In the same way, it benefits both the person who is beheaded and the person who beheads in maRumai (after death). kaNdAy – AzhwAr says that he is appealing to emperumAn who, as SrI rAma, removed the enemies (rAvaNa et al) of rushis (sages) in dhaNdakAraNyam (forest near madhya pradhEsh) as only he could carry out such a task. 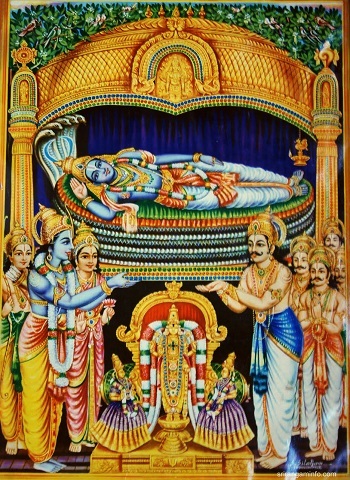 aranga mAnagar uLAnE – The purpose of adopting a lying posture at SrIrangam is to exterminate the enemies of followers who came after his rAmAvathAram, says the AzhwAr. It is your duty to put an end to the jainas, bhaudhdhas and Saivas who speak ill of you is the message conveyed here. An AzhwAr such as thoNdardippodi, who is full of mercy, who always goes in the path of righteousness and who is always at peace – how is it that he is talking of killing someone? More so, when vEdhas (sacred texts) forbid cruelty to others. (yajur vEdha says “na himsyAth sarvA bhUthAni” – no living creature should be harmed). Just as the same vEdha says elsewhere that it is alright to sacrifice an animal in yAgam (ritual) such as agnishOmIyam, this AzhwAr also asks for killing the abuser to save him from committing further sins. There is no friendship between the person who is deeply involved with the auspicious qualities of emperumAn and the person who abuses emperumAn (vyAkhyAthA quotes from thirumangai AzhwAr’s periya thirumozhi 11.5.7 “eNNAdha mAnidaththai eNNAdha pOdhellAm iniyavARE” – it is always pleasant not to think of those who do not think of emperumAn). We shall go on to the 9th pAsuram next. This entry was posted in mudhalAyiram, thirumAlai on August 26, 2016 by T N Krishnan.